August 2004, Sonoma County, CA — Tincknell & Tincknell, Inc., Wine Sales and Marketing Consultants, continue to lead the wine industry in the branding, positioning, and development of the super-premium, 3-liter, boxed wine packaging. T&T and Erickson Design of San Francisco, California, teamed together to create the branding, positioning, and packaging design for Brutocao Cellars’, of Mendocino County, California, new Bliss Box. T&T has been the advisory consulting firm for Amicus Cellars of Napa Valley, California, on its roll-out of the X Box, including branding and introduction into their national sales markets. The X Box complements the winery’s label, X Winery, by extending their high-value, super-premium wines into the new format. 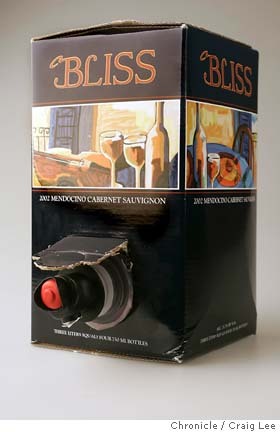 The Bliss Box is a “milk-carton” style 3-liter boxed wine, similar in shape to the Black Box, but expanding the wine label design concept into a loosely thematic triptych wrapping around the box. The name “Bliss” is a family name from the Brutocao family’s ancestry, and has been used to designate a single vineyard bottling as well as a branded second label. The inaugural releases of the Bliss Box will include a 2002 Mendocino County Chardonnay and 2002 Mendocino County Cabernet Sauvignon, all estate fruit from Brutocao Cellars’ vineyards. Suggested retail price in California will be $32.00 per 3-liter box for the Chardonnay, and $36.00 per 3-liter box for the Cabernet Sauvignon. 750-ml bottle versions of the same wines will sold alongside their box brethren. During a sales strategy meeting at Tincknell & Tincknell’s office in Healdsburg, California, the General Manager and Winemaker for Amicus Cellars, Reed Renaudin, became intrigued by the benefits of the 3-liter box packaging after examining samples of the Black Box and Blackburn Fine Wine Cache, two previous T&T projects. Soon after Amicus Cellars green-lighted a test run of 3-liter boxes of the winery’s high-value, super-premium Lake County “Eutenier Sylar Vineyard” Sauvignon Blanc, “Tri-County” Cabernet Sauvignon, and Los Carneros Chardonnay for 2004. Breaking new ground in the 3-liter box package will be the Sauvignon Blanc, becoming the first vineyard-designated wine in a box when it is launched. Tincknell & Tincknell advised Amicus Cellars throughout the project, including suggesting the name, X Box. Given the suggestive name, the X Box is positioned to appeal to young, trendy, adventurous wine drinkers. The test run of the X Box will be targeted towards restaurateurs for their wine-by-the-glass programs. Like the Bliss Box, the same wine in bottle will be in the X Box, giving a restaurateur the option placing it on their wine list, their by-the-glass list, or both. The box package is ideal for BTG programs as it costs less than bottled goods and eliminates waste due to loss from old, oxidized, or cork-tainted wine and breakage. The X Box will have a suggested retail price in California of $43.00 per 3-liter box. Tincknell & Tincknell were founded in 1997 with the recognition that the wine industry needed expertise in applying new business strategies and technology to compete in the global wine industry. Tincknell & Tincknell provide services and consultation in sales, marketing, and technology to wineries, wine industry business partners, and other companies specializing in luxury products. Located in Healdsburg, Sonoma County, T&T have assisted such clients as Louis M. Martini Winery, Groth Vineyards and Winery, Hanzell Vineyards, Howell Mountain Vineyards, Lynmar Winery at Quail Hill Vineyards, Via Pacifica Imports, Grassy Creek Vineyard & Winery of North Carolina, Dragon Seal Wines of Beijing, China, and the Qingdao Fushiwang Putaojiu Company of Pingdu, China. Tincknell & Tincknell assisted with the development of the industry’s first super-premium, 3-liter boxed wine, Black Box, with Ryan Sproule in 2002.